We treat following conditions: Mental Retardation, Cerebral Palsy, Epilepsy, Autism, Hyperactive, ADD, ADHD, Development Delay, Down’s Syndrome etc. We believe that there is an injury to the brain and based on the symptoms doctors see, they give any of the above names. E.g., if the injury is in the Cortex part of brain, we have a child with low cognition also called Mentally Retarded. If the injury in the mid brain (Cerebellum), we have a child with Cerebral Palsy as mid brain controls the motor coordination of limbs. If the injury is such that child perceives touch either too much (Hyper) or too less (Hypo), and the child’s vision is compromised (divergent or convergent strabismus, no depth perception, double vision etc), and the child’s hearing is disturbed (Slow Response Time, Painful Hearing, Auditory Selectivity, Auditory Distortion, Auditory Dyslaterality, etc). These children cannot trust their Tactile Sense, Vision or Hearing, rather just smell everything and are most likely diagnosed as Autistic. The trustees of the Institute are Mother and Father of a Special Needs Boy. When child was very young , he was diagnosed with Cerebral Palsy, however with therapy when Cerebral Palsy was cured, he was diagnosed to be Mentally Retarded and Autistic. And when the Autism symptoms improved with therapy, he was labeled as speech delayed child and hyperactive. Now the child can jump, run, speak, listen, follow commands, play and be mischievous. However his neurological age is lower than the chronological/physical age , so his diagnoses has been changed to Mild Global Delay. So the point is that the labels do not mean much more than telling you what symptoms show up, whereas the cause of the problem is an injury to the brain. The child mentioned in this section is not fully recovered yet, however he has made great improvement from the time when he had no head control and could not even sit by himself and could not understand most things and could not speak. It has taken over 2.5 years for this much recovery and based on this much progress parents are hopeful that in next 2 to 3 years he will recover fully. Mother has a fall while she is pregnant, A vaccine given to mother during pregnancy, A vaccine’s reaction when given to the child, Child falls from more than 3 feet, Genetic deficiency causing the slow down of brain growth , e.g., Down’s Syndrome, Alcohol or medication during pregnancy, Injury during delivery, Umbilical cord around the neck of baby choking him, High Stress to Mom during pregnancy, Some infection that affects the nervous system, pesticides in our food, etc. Everyone knows the five basic senses; seeing, hearing, taste, smell and touch. But there are other senses that are not as familiar including the sense of movement (vestibular), and sense of muscle awareness(proprioception). Unorganized sensory input creates a traffic jam in our brain making it difficult to pay attention and learn. To be successful learners, our senses must work together in an organized manner. This is known as sensory integration. The foundation for sensory integration is the organization of tactile, Vision, Hearing, Proprioceptive and Vestibular input. A person is diagnosed with ADD or ADHD, Autism, Cerebral Palsy, Speech delay or Learning Disability etc, may in fact have an immature nervous system causing sensory integration dysfunction. This makes it difficult for him/her to filter out nonessential information, background noises or visual distraction and focus on what is essential. The relationship between sensory integration, learning and attention will be discussed below. Tactile sense is our ability to learn from our environment through our sense of touch. This includes knowing how heavy, smooth, rough, big or small an object is just by holding it. In addition, this sense has a protective component which causes us to pull our hand away from a hot stove. Tactile integration is important for the development of body awareness, fine motor skills, motor planning and being comfortable with touch. Examples of unorganized processing of tactile input may be seen as someone who has trouble in crowds, pulls away from hugs, is bothered by certain clothes or foods, or has to touch everything. If someone is attending to the tags in their clothes or the seams in their socks, they are not able to focus on what you are saying; they are not ready to learn. Vestibular sense provides information related to movement and head position. The vestibular sense is important for development of balance, coordination, eye control, attention, being secure with movement, emotional security and some aspects of language development. 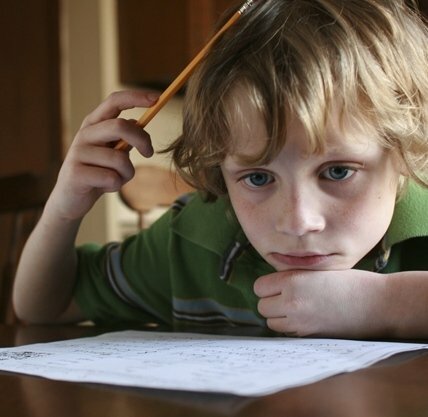 Disorganized processing of vestibular input may be seen when someone has difficulty with attention, coordination, following directions, reading (keeping eyes focused on the page or board) or eye-hand coordination. Disorganization may also be seen in someone who is constantly in motion, has an extreme fear of movement, or is described as an overly sensitive, lazy or sedentary person. Immature language skills can often be the reason a child is initially referred for therapy, but the language delay may be the result of immature sensory processing. Proprioception is our ability to know where our muscles and joints are in space and how they are moving. This is very important for the development of body awareness. Our proprioceptive sense cannot work in isolation, but requires constant input from our tactile and vestibular systems. 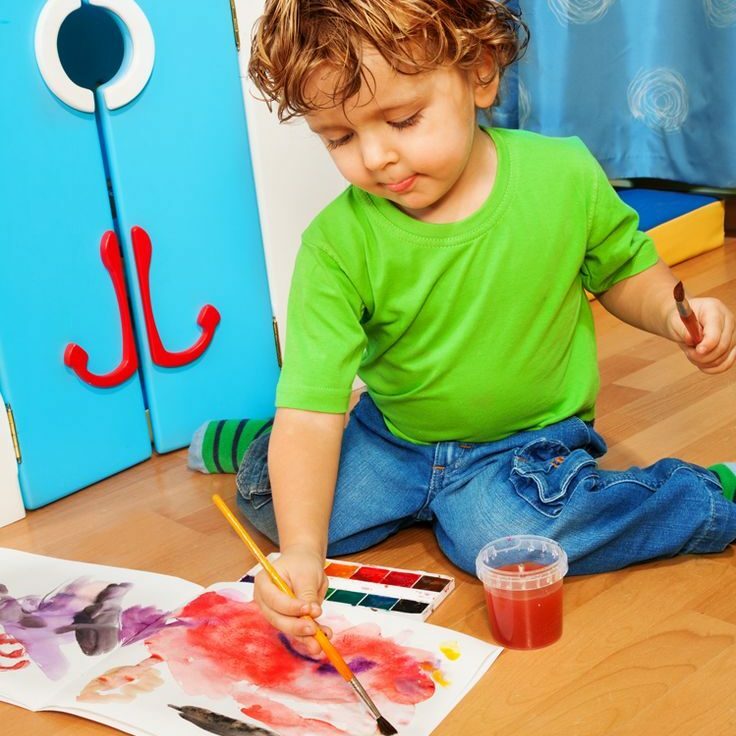 Unorganized processing of proprioceptive input may be seen as someone who is clumsy, falls or stumbles frequently, is overly aggressive (e.g., tackles people), walks on toes, constantly chewing on food or objects, has difficulty motor planning, or is messy at mealtime. Someone who is unconsciously worried about where their body is on the chair or how they will walk around the table without bumping into it, will not be able to focus their attention on what is being said or what they are carrying. When the above sensory systems are intact, learning is effortless and easy. Immature systems make paying attention and therefore learning difficult and frustrating. Primitive reflexes are developed during pregnancy and follow a universal pattern that is encoded in the brainstem. They are present at birth and follow a typical progress of emergence and disappearance along developmental timelines. Their role is to ensure the survival of the baby. So, for example, when there is a loud sound, the baby reflexively throws out arms and legs which elicits a visceral response from the mother to protect her child. Reflexes relating to upright posture develop after birth, as the baby learns to move its head and limbs, to coordinate what it sees, hears, touches, moves and to crawl. The role of these postural reflexes is to support standing and sitting in the upright position and to develop conscious or voluntary movement. The cerebellum is the large protuberance at the brainstem that looks like a little cauliflower. 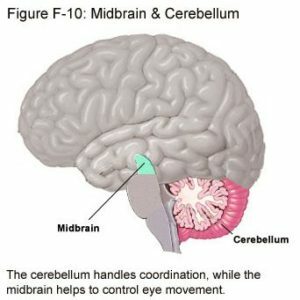 It has been suggested that the cerebellum is the key to learning anything. It may well be the key to normal cognitive and emotional development. There is a feedback loop in the brain from the cerebellum up to the frontal cortex which helps integrate sensory perception and movement. When the senses and movements are functioning well, they in turn help to integrate our emotional responses, our language abilities, our impulse control and our executive functions of reasoning, planning, organizing and problem solving. The basal ganglia’s main function is to enable us to sit still. It is situated at the top of the brainstem and has nerve nets that connect with the thalamus, the cerebellum and the frontal lobes. Many parents and teachers do not realize that “sitting still” is actually a complex brain mechanism requiring certain developmental processes to be in place. If these are not, then to sit still is to lull the brain to sleep and the child must move in order to focus and concentrate on what’s being said. So the “sit still and listen” choir is becoming outdated because it sets the child up for failure and produces the opposite effect which is to zone out the verbal directives as the brain pulls all its resources into the momentous task of sitting still. Some special education schools, under the guidance of their occupational and physical therapy teams, are beginning to understand this and are supplying large therapy balls for students to sit on while at their desks. So the basal ganglia functions as a “brake”. To sit still, the brake is applied to all movements except the reflexes involved in remaining upright. To move, the brake is released on these and applied to some other of the reflexes. In children with challenges, they may not have their involuntary reflexes under the full control of the basal ganglia and therefore we may be asking them to do what is developmentally impossible. In this case, we have to take them back to the primitive reflexes and help them to integrate these before expecting postural control and interface with the visual and auditory functions.